New Delhi, 19 July 2017: The Ministry is implementing a central sector scheme called Deendayal Disabled Rehabilitation Scheme (DDRS) under which grants in aid is provided to Non Governmental Organizations (NGOs) for running any of the prescribed model projects under the Scheme relating to rehabilitation/empowerment of persons with disabilities. State-wise Grants-in-Aid released to Non Governmental Organizations (NGOs) including to the State of Chhattisgarh under DDRS is given. The District Disability Rehabilitation Centres are set up in the approved districts of the country for providing comprehensive rehabilitation services to persons with disabilities at the grass root level under the Plan Scheme, "Scheme for the implementation of Persons with Disabilities (Equal Opportunities, Protection of Rights and Full Participation) Act 1995" (SIPDA). A statement indicating State wise Grant-in-Aid released to DDRCs including in the State of Chhattisgarh is at Annexure-II. 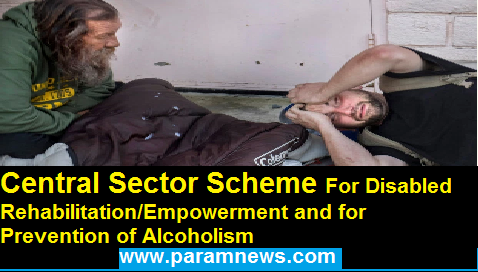 To provide for the whole range of community based services for the identification, motivation, counseling, de-addiction, after care and rehabilitation for Whole Person Recovery (WPR) of addicts to make a person drug free, crime free and gainfully employed. This information was given by the Minister of State For Social Justice And Empowerment SHRI THAAWARCHAND GEHLOTSHRI BANDARU DATTATREYA today in a written reply to a Lok Sabha question. The Ministry is implementing a central sector scheme called Deendayal Disabled Rehabilitation Scheme (DDRS) under which grants in aid is provided to Non Governmental Organizations (NGOs) for running any of the prescribed model projects under the Scheme relating to rehabilitation/empowerment of persons with disabilities.